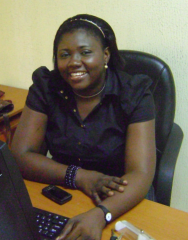 The eleventh recipient of the Senesh Graduate Fellowship for 2010-2011 is Isioma Olivia Kemakolam from Nigeria. She will be pursuing a Master’s degree in Peace and Reconciliatory Studies at Coventry University, Coventry, UK. Her proposed thesis topic is: “Building the Capacity of Traditional Institutions for Enhanced Participation of Women in Peacekeeping”. Until joining the Centre for Law Enforcement Education (CLEEN FOUNDATION) Lagos State, Nigeria in 2006, as the Programme Officer, she was a Project Officer of Human Rights Education with the Civil Liberties Organisation. She holds a Bachelor’s degree in Microbiology from the Enugu State University of Technology (1997) and practiced that profession until she made an entry into human rights work in 2001. She has extensive professional experience in human rights, gender, justice sector reform, and community peace building. She is presently the Senior Programme officer, Public Safety and Security Department of the CLEEN Foundation. Her membership of professional bodies includes the Women in Peacebuilding Network, the Network of Police Reform in Nigeria, and the Coalition for Peace in Africa.